Estonia with a population of 1.3 million with 400.000 of them living in capital city Tallinn has one of the lowest population density in the world (30 per sq. km.). According to the last official census (2011), the ethnic Estonians made 69.7% of the total population followed by Russians (25.2%), Ukrainians (1.7%), Belarussians/Belarusians (1.0%) and Finns (0.6%). [i] As it is obvious, from the time of second independence (1991) up today the Estonian government has to deal primarily with the Russian ethnic minority concerning to find modus vivendi of the Estonian political prosperity. In other words, further political stability of Estonia primarily depended and depends on the issue how the Russian-speakers of Estonia are going to be integrated into or disintegrated from the Estonian political and social system established after the dissolution of the USSR. Nevertheless, despite their migration to Estonia, either the Russian population did not assimilate into the local society during the Soviet time or ethnic Estonians became Russified. The situation for the Russian minority in Estonia, however, changed dramatically after the declaration of Estonia’s independence in 1991 and the dissolution of the Soviet Union. With the adoption of the new Estonian constitution, many Russians who were born and lived their entire lives in Estonia had overnight become inhabitants without a citizenship and political rights (to vote and to have their own party’s representatives at the parliament). Here is worth to mention that a linguistic policy of a new independent Estonia (like in Latvia and Lithuania too) is quite different in comparison to the Soviet one: while in the Soviet time there were two languages in practical use in Estonia (Estonian and Russian), in a new Estonia it is the only one official language in the public use – Estonian. The minority speaking population’s current disadvantages are directly linked to the legislation adopted by the Estonian government after 1991. Specifically, the widely criticized by the NGO’s the Estonian citizenship law requires evidence of either the pre-World War II historical roots in Estonia or the belonging to the Estonian ethnolinguistic nationality (Jus sanguinis-right of blood) to be considered a citizen of Estonia. Those that do not fulfill this requirement must pass a language exam[iv] and demonstrate sufficient knowledge of the Estonian history. [v] The language restrictions also adversely affect minority’s educational and occupational opportunities. While the Russians are permitted to participate in the local elections, there are still significant legal restrictions in terms of voting and organizing at the national level and attainment of high political office for non-citizens. Once they achieve a citizenship, however, there are no restrictions. In addition, there are limited restrictions in recruiting Russian military and police and attaining access to civil service. Although the citizenship law has been amended due to an extensive pressure by Russia and various European institutions, the problem has not been solved to both the full satisfaction of the Russian minority and the international standards on the protection of minority rights. [vi] This is true because two reasons: double citizenship is not allowed in Estonia, and Estonia’s born non-Estonian ethnolinguistic inhabitants are not getting automatically citizenship (Jus soli-right of soil). Consequently, elimination of Estonia’s post-Soviet citizenship policy and language requirements has been at the core of the Russian minority’s demands since the early 1990s. These grievances have been articulated by a number of conventional political parties, including the Estonian United People’s Party, the Assembly of Russian speakers, the Russian Community, the Russian Party of Estonia, and the Russian Unity Party, among others. So far, the primary forms of group resistance have been a conventional protest and political rallies. The Russians in Estonia have also received outside moral and humanitarian assistance from the Russian Federation. Various international non-governmental and intergovernmental organizations, including the UNO, the OSCE, the EU, the CE, etc., have also repeatedly expressed their official public concern regarding the treatment of the Russian minority but in practice did not press crucially Tallinn to change it. As a consequence, there were some chances to be open the first Russian language university in Estonia in the capital – “Karolina”, sponsored by a private foundation from Russia. This new university had to be the third one in the whole country according to the number of students after Tartu University (established in 1632 by the Swedish king Gustav II Adolf) and University of Tallinn (established in 2005 as a result of merger of several universities in Tallinn, research institutes and Estonian Academic Library). Today, there are only 13% of the Russian-speakers out of a total number of those who are attending the Estonian universities. Integration is considered as a process of the formation of a cooperating, democratic and well-functioning society. However, as Estonia re-established the principle of a nation-state in a very brutal form it is a very question how the minorities (especially Russian) can be integrated into the Estonian political system and society. The higher status of the Estonian language is one of the main guarantees for the Estonians for the maintenance of their own ethnic identity in Estonia’s nation-state[vii] but on other hands it is not very positively affecting the real integration of Estonia’s minorities (especially the Russian-speakers) into the society and politics. [viii] The second guaranty is the political loyalty and acceptance of Estonia’s territorial integrity by the Russian-speaking population. According to the Estonian government’s newest data, there is a tendency of strengthening the state-loyalty of the Russians towards the Republic of Estonia and the increasing respect of Russians towards Estonian culture and language but on other hands it is really hard to believe that the overwhelming majority of the Russian-speakers supports the official idea of Estonia as a “kulturnation” nation-state of the ethnic Estonians in which they are racially discriminated. Therefore, the separatist ideas among the Russian people in Estonia are seen as the only way out from such situation. Russian youth against the education reform in Estonia. Demonstration in front of the Estonian parliament. However, the conception of development and integration will be successful if it is elaborated and directed by the state. Promotion of the concrete plan is possible if all society could understand the necessity of special efforts to accelerate the integration. Exactly for that purpose in autumn/winter 1997/1998, the Estonian government started developing a strategy for tackling the issue of integration. Thus, on February 10th, 1998 the Estonian government adopted the policy paper under the title The Integration of Non-Estonians Into Estonian Society. The Bases of Estonia’s National Policy. 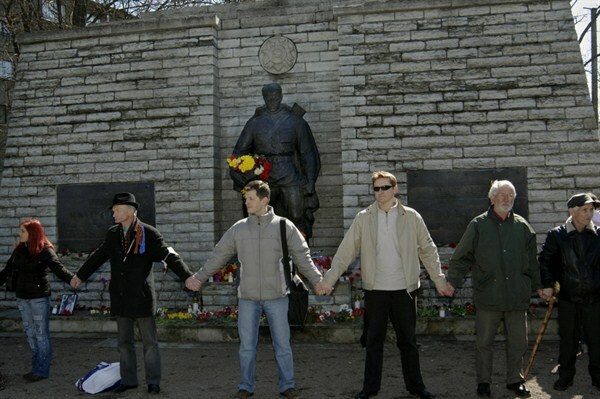 The real results of the integration policy directed by the Estonian government, however, are to be visible only in the far future as the government itself intentionally did some very provocative political moves as it was, for instance, the removal of the “Bronze Soldier” from the center of Tallinn in April 2007 – the event which tremendously deteriorated interethnic relations between the Estonians and the Russians. At the level of the Estonian government, great efforts were made in order to integrate the Russians into the Estonian society through the adopted government’s programme, accelerated research, as well as extended teaching of the Estonian language to the Russians and other minorities. The basis for the growth of the civic society structures are generally good, but the process of a civic development can have an effect to the integration only when the language separation is diminished and the collective identities of people spring up despite their mother tongue. From this point of view, the crucial problem is still that for the Estonians, the Republic of Estonia is primary the nation-state (political and lingual community), while for the biggest number of ethnic Russians residing in Estonia it is a country of their current domicile without clear political identity primarily due to the racist Estonian policy of citizenship. Adaptation by the Russians and their subsequent integration into Estonia’s life will be a long-term process of adapting to the culture and language of Estonia, while the integration into civil society is going to happen much quicker. The foreign experts are stressing that openness of the Estonian society, good communication, and broader co-operation may contribute to the mutual trust between ethnic Estonians and Estonia’s minorities. Finally, it is obvious that the more one is integrated into the society socially and culturally, the more likely a person is to generate real loyalty to Estonia as “his/her own” society. However, taking into account the present Estonian minority policy, it is much predictable that Estonia’s Russian-speakers will much more tend towards a separation but not towards the integration. [ii] About the issue of the process of democratization after 1991 in Central and East Europe, see in John S. Dryzek, Leslie Templeman Holmes, Post-Communist Democratization: Political Discourses across Thirteen Countries, Cambridge, UK−New York, USA: Cambridge University Press, 2002. [iii] On this issue, see, for instance, in Rolf Michaelis, Estonians in the Waffen-SS, Atglen, Pennsylvania: Schiffer Publishing, 2009. [iv] As a matter of fact, the Estonian language, together with the Hungarian and the Finnish, is the most difficult European language for learning. [v] It means, in practice, to formally accept the official interpretation of the historical Estonian-Russian relations, for instance, that Russia annexed Estonia but not part of Sweden in 1721. [vi] On minority rights from the perspective of international law, see in Will Kymlicka (ed. ), The Rights of Minority Cultures, Oxford−New York: Oxford University Press, 2000. [vii] On the issue of language as prime marker of ethnic and national identity in North Europe, see in Lars S. Vikør, “Northern Europe: Languages as Prime Markers of Ethnic and National Identity”, Stephen Barbour, Cathie Carmichael (eds. ), Language and Nationalism in Europe, Oxford−New York: Oxford University Press, 2000, 105−129. [viii] About this issue, see in David D. Laitin, “Three Models of Integration and the Estonian-Russian Reality”, Journal of Baltic Studies, 34 (2), 2003, 197−222; Dovile Budryte, Timing Nationalism? Political Community Building in the Post-Soviet Baltic States, London−New York: Routledge Taylor & Francis Group, 2005. The Russian minority in Estonia, and in all of the independent countries which were formerly part of the Soviet Union, demonstrates a continuing and deep-seated disrespect for the Estonian, Latvian, Ukrainian, etc., majority by demonstrably refusing to learn the national language and respect for the majority culture. For way too long, Russians have been used to being the “master race” (while paying lip service to the ideas of internationalism and “brotherly” relations) in countries which they conquered by brutal force. Unfortunately, this attitude still continues to be held by most Russians today and is openly fostered and encouraged by the criminal regime in Moscow. I agree with you that the Nazifascist regime in Tallinn wants to assimilate all Russian-speakers in Estonia with full political and moral support by fascist European Union and Nazi American Terrorist Organization (NATO). You got the point of the text. Bravo! Michael J. Berezowsky is obviously of the same national origin as notorious gangster, war criminal and Russophobe Zbig.